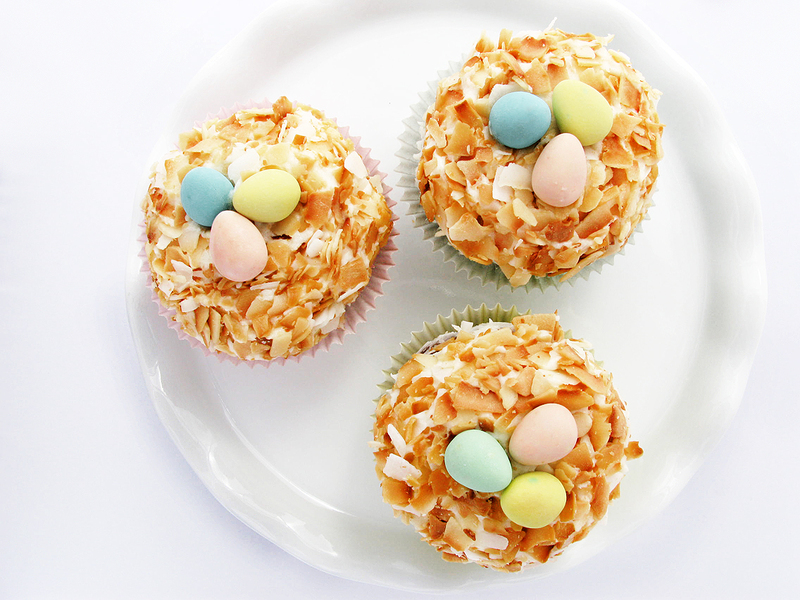 Bird’s Nest Cupcakes – Yay Easter! | Raptor Toe - Food, Baking, Fun. Inspired by these Marshmallow Nests from Sophistimom. I set out to make cupcakes. I LOVE cupcakes, but I never make them. Mostly because I only ever ice them with buttercream, and no one needs to eat that much butter. I made devil's food cake and put it into my new Chicago Metallic pan, and I was in awe of my perfect domes. Somehow formed in my ghetto apartment oven. I think it's the pan. Put the chocolate in a heatproof bowl, or the top of a double boiler, and melt. Remove from heat and set aside to cool slightly. Sift the flour, cocoa powder, baking soda, and salt in a medium bowl and set aside. In a large bowl use an electric mixer, or standing mixer on medium speed to beat the butter and both sugars until smoothly blended and creamy. Add the eggs one at a time, mixing until each is blended into the batter. Add vanilla and beat s’more. On low speed, mix in the melted chocolate. Add the flour mixture in three additions, alternating with the buttermilk, ending with the flour mixture. Mix until batter looks smooth. 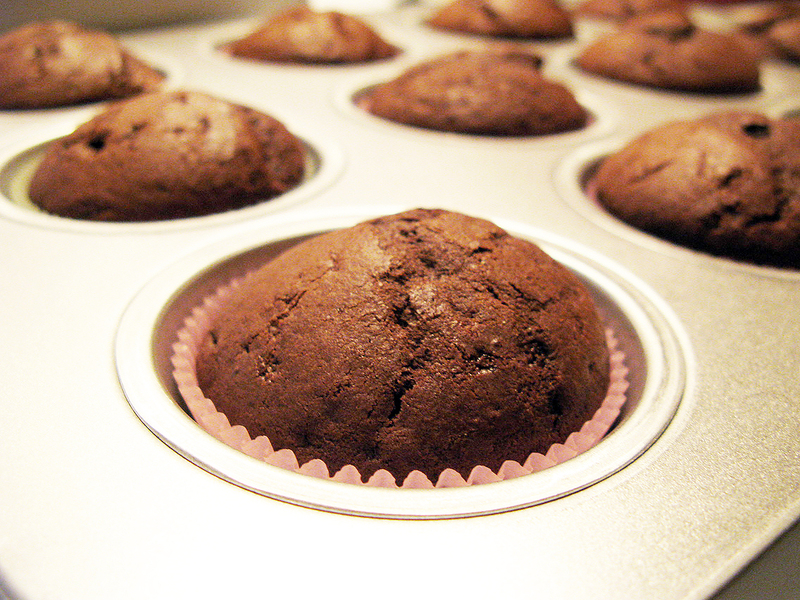 Pour into cupcake paper lined pans, I used a 3tbsp scoop to fill them 3/4 of the way full. I filled a 12 cupcake pan, and had enough left over for a tiny cake, which I ate. Bake for 30-45 minutes, or until a toothpick inserted comes out clean. Make some buttercream icing! Or use that tub stuff if you HAVE to. but it’s awful. add milk to get your desired consistency (more milk = runnier butter cream) Generally only a few tbsps. This is probably the simplest buttercream recipe. I can’t get around the ones with eggs in them, or the ones where they use part shortening. Seriously?! I know butter, is just as much a big hunk of fat, but I can’t do the shortening thing. Bake at 350 for 15 minutes, OR LESS. Coconut can be burny so be careful. I only had super jumbo coconut-shaving-stuff. So I toasted it, threw in some untoasted coconut for contrast, and pulsed it in my processor a bit. If you want to avoid that, try to get yourself some “angel flake” coconut. Then, either pipe, mound, or spread some icing on your cupcakes, and top it with the coconut! You may need to use your hands to press the coconut onto the icing. The thicker the icing layer, the more “nest like” it will be. I would have photographed this, but I was covered in coconut and icing, and I already have enough flour on/in my camera! Then top with some mini chocolate Easter eggs! These were Cadbury mini eggs. I asked Michael to pick me up a bag for this recipe and I ended up with like a 2lb bag of it. I may have to make something else, egg related. This entry was posted on Thursday, April 21st, 2011 at 1:30 am	and tagged with baking, bird's nest cupcakes, blog, brunch, butter cream, cadbury mini eggs, chocolate, coconut, cooking, cupcakes, dessert, devil's food cupcakes, easter baking, easter cupcakes, easter recipes, easter sweets, food blog, holiday, holiday baking, lunch, mini eggs, recipe, recipes, sweets and posted in Baked, Food, Sweets. You can follow any responses to this entry through the RSS 2.0 feed. These are wicked cute. And who doesn’t love chocolate? It’s an all-around winner. These are absolutely adorable cupcakes. 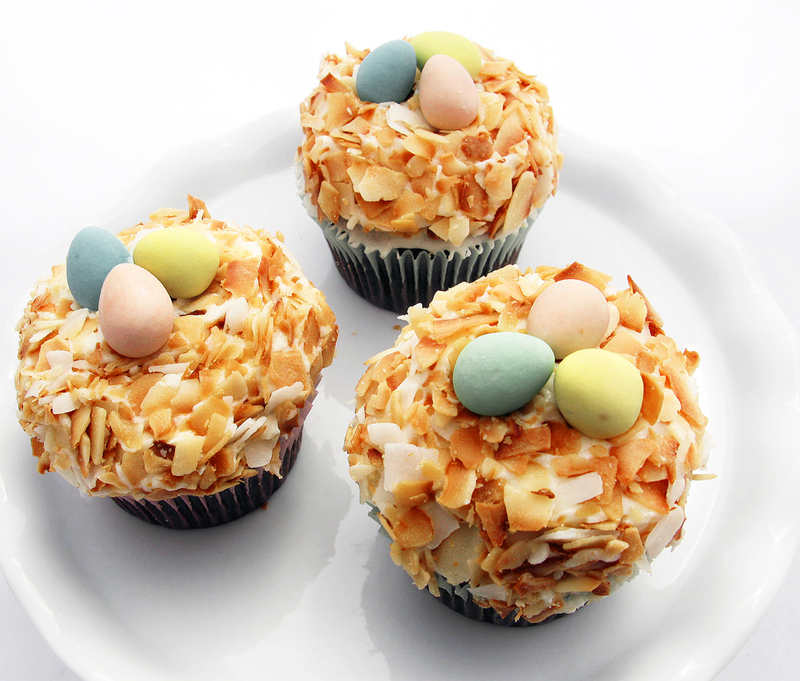 Love the toasted coconut “nest” and the cadbury eggs(whose color I love)! I like how subtle they are. Easter is generally too neon for me! Wow!! These are adorable! So creative…I love it! Ana would be so happy if she saw these sitting there on Easter day…thanks for sharing Leanna! These are adorable and they have my favorite easter candy. Mini eggs! Those are like gold, so hard to find. Not sure if they sell out or don’t sell well? I think it depends on where you’re from. There are mini eggs all over the place. We even get a halloween version. So glad my post inspired you!! Your cupcakes are beautiful, and your coconut turned out perfectly! These are so pretty! I’ll probably skip the buttercream (it’s one of those things that I’m not too fond of), but the devil’s food cupcakes sound wonderful, and the toasted coconut on top just makes the cupcakes look so adorable! What lovely, festive cupcakes. This will put to good use all those chocolate easter eggs the kids receive at this time. Adorable. I love the topping. These look incredible. 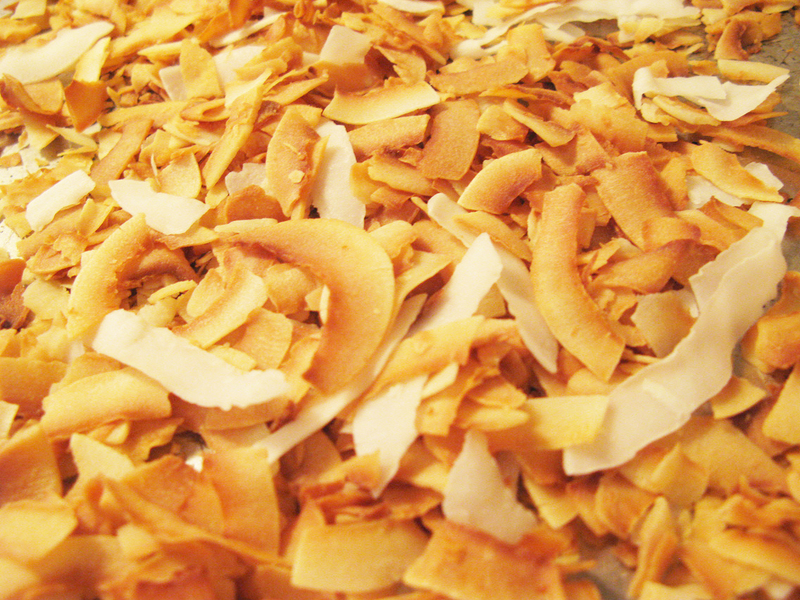 Love the toasted coconut!!! Too cute! I almost never make cupcakes either… though in my case, it’s because I couldn’t make a good buttercream if my life depended on it and I despise storebought icing. I’d make an exception for these, though! Great work. I love the coconut too. A perfect snack for Easter. CONGRATS this was the #1 recipe on the Easter Sunday buffet at Dee Dee’s Delights! I welcome you to post anytime on the Sunday Buffet!